Some Elders from another area came to our area to go to the store, & chill. The other Elders don’t have any stores in their area, so they came to our area to get money out of their accounts and shop. We bought a dozen donuts and 4 liters of chocolate milk and went to a member’s home to watch a church movie. So, it was a good p-day! We had a district meeting in the morning and then I went on divisions in Loma Verde (which is North from Managua, near Tipitapa) with Elder Hughes from CA. We met a lot of their investigators that are preparing to be baptized. I did a baptism interview for an 8 year old boy. He was awesome! He knew everything! 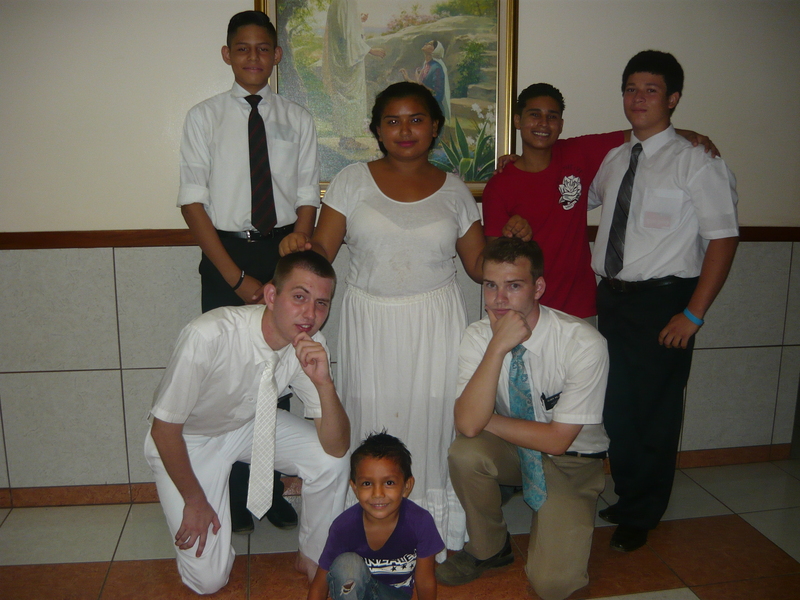 The missionaries didn’t realize it, but we came to find out, that the little boy’s mother is a member. I’m not sure my interview is valid anymore since the Branch President should have interviewed him. It was a good day. I performed a bunch of magic tricks and the people enjoyed those. 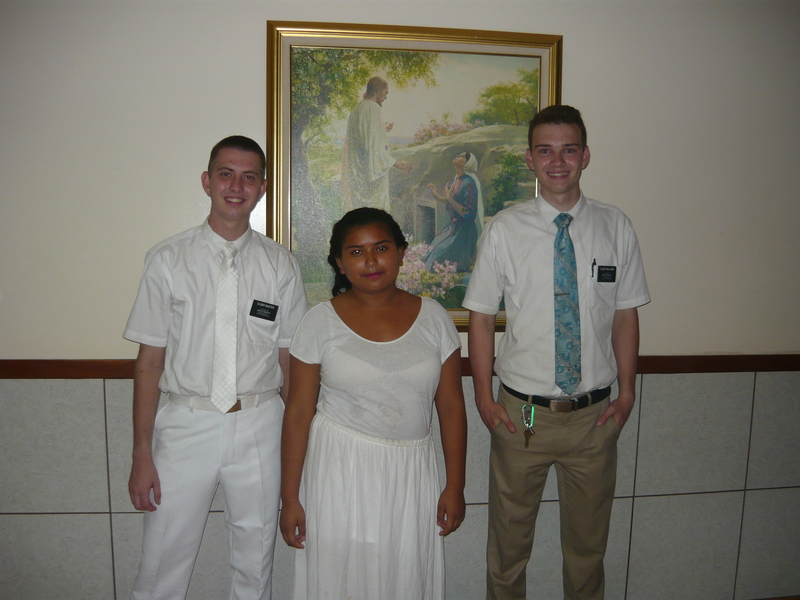 We met with an 18 year old active girl who helps the missionaries out a bunch. She said she doesn’t think “I’m gringo because I understand too much”. She was impressed with my ability to make puns in Spanish. We focused on getting permission for Adrianna to be baptized. We went by her house, but she wasn’t home. So, we stopped by the home of a reference that a member had given us when I first got to this area. We’ve only met with her once and she wasn’t home this time either. We are having a hard time connecting with her. We also visited with this huge family & we really want them to go to church. Every time we are passing by, there’s always tons of different things going on in their home: blasting music, playing games, or their playing football & soccer outside. It makes it hard to have a quality visit with them. They keep saying they’ll go to church, but they have yet to follow through. After that, we had Brian (the 13 yr. old son of the 2nd Counselor in the Bishopric) come with us to meet with Jason ( our investigator who was able to shake Elder Renlund’s hand a few weeks back). Brian is awesome! He’s always joking around with us. Jason is trying to overcome some word of wisdom problems. Brian is a leader in the Young Men’s Program so he came along to invite Jason to some YM’s activities. Then, we went by to try to teach Gigi (she’s the reference from Norland who has gone to church twice and attended institute once with Norland). Unfortunately, she wasn’t there either. She always gets home really late. We passed by Naomi’s (attended church 4-5 times, & a baptism). She is progressing a little slower but she does fulfill her commitments and is reading the Book of Mormon. We stopped by Adrianna’s again, but we missed them again. Our tentative baptismal date for Adrianna was Friday, so Thursday was the last day we could get permission & plan the baptism. We talked to Adrianna for awhile & she was really positive. Then, her mom came out and we showed her the baptismal form. She got really mad and kept saying “No!” she would not give her permission for Adrianna to be baptized. So, we started thinking this isn’t going to happen, but right before we were going to leave, her mom randomly agreed to sign the form. We have no idea why she changed her mind! That night we visited Jason and Naomi again to invite them to the baptism the next day. The baptism was scheduled for 7:00p.m. We went on divisions at 5:30 trying to round up some member support & asking them to invite people to the baptism. We went to get Jason for the baptism and he wasn’t there! He had promised us he would be there the day before. We were pretty frustrated! We waited and looked for him for about 10 min. As we were leaving, we heard a shout from behind us & it was Jason. So, he came with us to the church even though he was late. When we got to the church, we realized we didn’t have a second witness. So, we had to call Bishop to come be a witness, but it took him an hour to get there. So, we weren’t able to start the service until after 8:00p.m. The service was awesome! Adrianna started crying before she entered the font and we could tell that she was really feeling the spirit. She was really thankful to Hermana Concepcion (Coni for short) for introducing her to the gospel. As we were leaving, Jason told us he really felt the spirit and asked us, “Did you feel that too?” He enjoyed the service and wants to prepare to be baptized as well. That was awesome! Saturday we were just doing our normal visits and we got a call from the Bishop asking us to come down to the church right away because he needed our help with something. We thought, “Oh Boy! What does he need?”. When we got there, the Primary was having a Talent Show. He had heard that I could do magic tricks. So, he wanted me to perform some magic tricks for the kids. We got ice cream afterwards, so that was nice. Good day! Adrianna got confirmed which was awesome! Hermana Coni’s (she’s the one who introduced Adrianna to the gospel and has been fellowshipping her) family really likes the missionaries. She’s a recent convert. Her husband isn’t a member and we don’t see him much since he’s only home on the weekends. Her niece, Kayleen (15), her son Reuben (14), & Ronnie (10) have all been baptized because of her. We’ve been teaching Adrianna in their home. Now, her other son, Michael & his wife Wendy are investigating the church as well. They want to get married so that he can be baptized. Her daughter, Evelyn, has already been married so she can be baptized. Her spouse came to church this week! 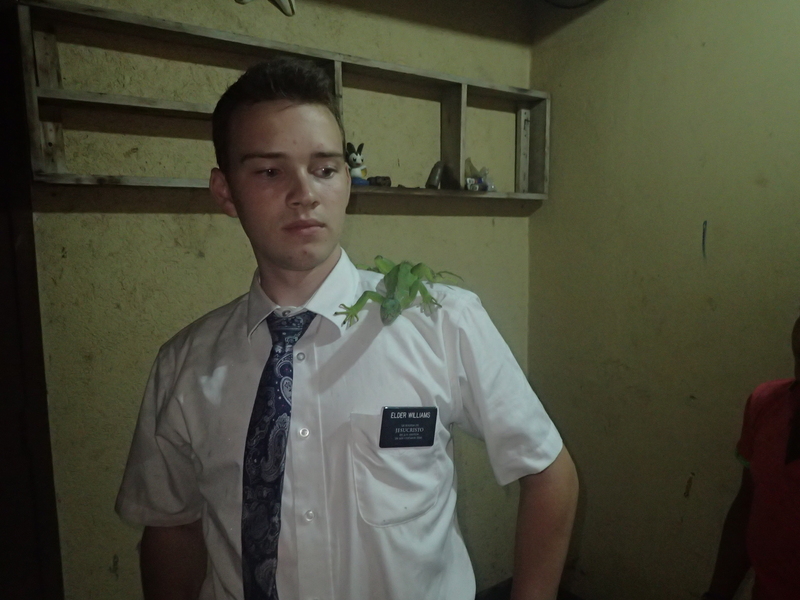 We are hoping to be able to teach him too so they can prepare to go to the temple! Naomi came to church again which is awesome, we just need to help her strengthen her testimony! After visiting with Naomi and her mom for bit, we ate lunch with the Bonia family. Then, we went to Coni’s house and spent time teaching Michael, Wendy, & Evelyn and playing games. I got a mini CLUE game! The Nica’s have a hard time understanding that game though. We were able to go to the Distribution Center and stock up on new church movies, & Preach my Gospel. 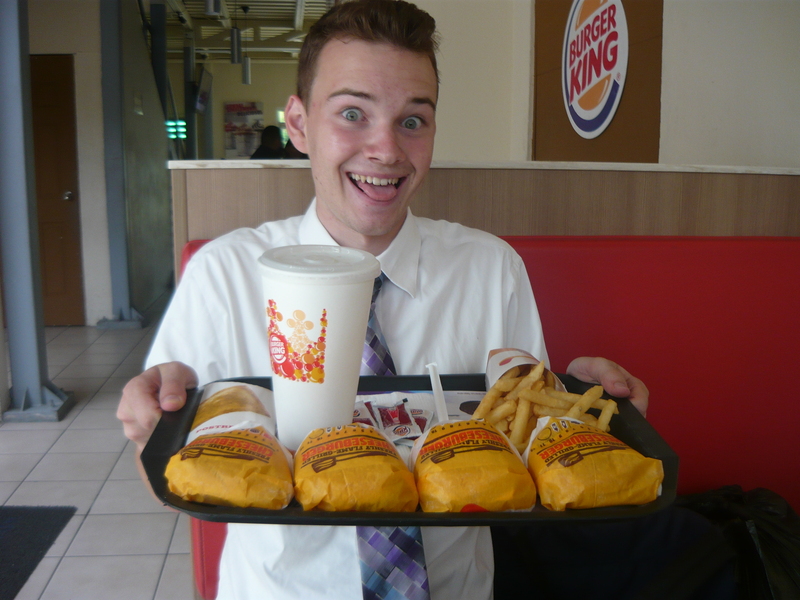 We went to Burger King and I ate an insane amount of food! I ate 4 hamburgers, large French fries, a large drink and an apple pie! We had a really great week! We had a lot of fun! The baptism was awesome! This is our last p-day before transfers. The district is really doing well, we had 8 baptisms this week! Miss you guys! Have a great week!